Robert de Lacy (1) succeeded his father Ilbert de Lacy probably between 1090 and 1100. As well as inheriting the honour of Pontefract and his share of his father’s lands in Normandy, Robert de Lacy also received the honour of Clitheroe. These lands had belonged to King Edward (the Confessor) in 1066 and consisted of 3½ hides or 21 plough-lands, the remainder consisting of 28 manors, held by 28 freemen or thegns and rated at 73 ploughlands. After the Norman Conquest they were given to Roger de Poitou, along with the honour of Halton, and he sub let them to Roger de Busli and Albert de Greslet. It also seems that some of Roger de Poitou’s lands were held of him by Ilbert de Lacy(1) and when Roger was banished for supporting his elder brother Robert de Belleme, 3rd earl of Shrewsbury, against the king in 1102, the honour of Clitheroe and the lordships of Blackburnshire and Bowland were given to Robert de Lacy (1). Henry I granted ‘Boeland to this Robert, son of Ilbert, to be held of the Crown in capite as it had theretofore been of Roger de Poitou’. In the early years of the reign of Henry I Robert de Lacy appears to have taken a leading role in maintaining royal authority in the north of England. However, by 1114 he had been dispossessed and was living in exile, probably in Normandy. The reason for this is not clear. It has been suggested that he joined a rebellion against the king that supported Robert Curthose, duke of Normandy, but this took place in 1102 when Roger de Poitou’s confiscated lands were given to Robert by Henry I. So what happened around 1114 that resulted in him losing all his English lands? The reason is probably connected with the ongoing problems between England and Normandy. Although Henry had made peace with his brother Robert Curthose, he later invaded Normandy and defeated Curthose at the battle of Tinchebray in 1106. Curthose was taken prisoner and Henry took control of Normandy – except that keeping control of so many volatile land owning lords was never easy. One lord who presented Henry with problems was Robert de Belleme, the 3rd earl of Shrewsbury and elder brother of Roger de Poitou. His allegiances changed according to his own best interests. He had led Robert Curthose’s reserve army at Tinchebray, but had later made peace with Henry. However, Henry suspected him of plotting a rebellion in favour of Curthose’s son, William Clito, and issued a list of charges against him. When Robert went to the Norman court in November 1112, Henry had him arrested and imprisoned at Wareham, where he remained for the rest of his life. It was following this that Robert de Lacy lost his English lands and was banished, so my assumption is that he was in some way involved, or suspected of being involved, in Belleme’s plot. Robert de Lacy’s wife was named Matilda. They had three sons and one daughter. Their eldest son was Ilbert, a second son, Robert, was the only knight to be killed at the Battle of the Standard on 22nd August, 1138, and their third son was Henry de Lacy (1) who inherited from his elder brother, Ilbert. Their daughter was called Aubrey (or Albreda). The evidence for a son named Robert comes firstly from a charter confirming the grant of St Mary Magdalen in Barnstaple to St Peter of Cluny. Two of the witnesses were Ilbert de Lacy and Robert de Lacy (in that order). If this Robert had been Ilbert’s father he would have signed before him. A younger brother would have signed after him. Another occasion was in Normandy during the reign of Henry I when Ilbert and his brother Robert were accepted at court on one of Henry’s last visits to Normandy. The brothers witnessed a royal charter at Perrieres, in what is now Calvados, not far from the Norman estates of the de Lacy family. Ilbert’s brother Robert is also mentioned in a charter concerning lands in the honour of Clitheroe. Robert de Lacy (1) also had an illegitimate son named Ralph le Rous (the red). One of the first things that Robert did when he received the honour of Clitheroe was to make a grant of lands to Ralph, in a charter dated 23rd November 1102, which included Great Mitton and from this time Ralph and his descendants took the surname de Mitton. We can be certain that Ralph was a son of Robert’s because when Ilbert de Lacy (2) was confirming his father’s grants following the restoration of the lands in 1135, his charter reads ‘eidem Radulfo fratri meo’ – the same to my brother Ralph. This grant was also made with the consent and advice of ‘my brother Robert’, another piece of evidence for a third legitimate son of Robert de Lacy (1). There is no date for Robert de Lacy’s death, but he had died by 1129 when Robert de Lisours paid £12.9s.4d to marry his daughter Aubrey (or Albreda). In the Pipe Roll she is described as the sister of Ilbert de Lacy and not the daughter of Robert de Lacy, which she would have been had her father still been living. Robert de Lacy was the first member of his family to found a monastery. 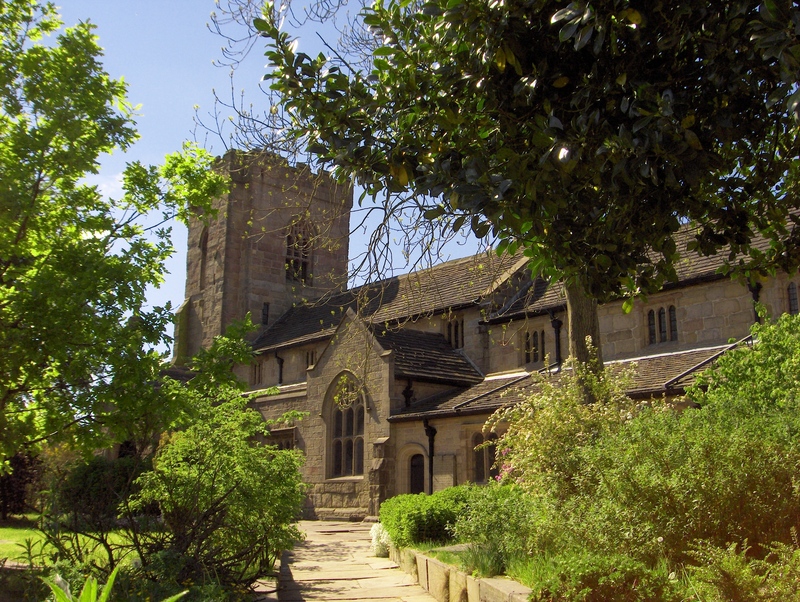 He founded the Cluniac priory of St John the Evangelist at Pontefract in 1090, during the reign of William Rufus. The establishment of the priory was for the good estate of the founder and the souls of William I, the founder’s parents—Ilbert and Hawise—and all his ancestors and heirs. His wife Matilda is not mentioned so it seems probable that they were married after this date. Robert also made a grant of land to a group of hermits who were resident in the woodland around the town of Nostell. He gave half a carucate of land on which the chapel of St Oswald, the king and martyr, stood (or stood afterwards) and two bovates of land in Hardwick which belonged to the church. There is a story surrounding the foundation of Nostell Priory which tells that Ralph Adelavus, who was a chaplain and confessor to Henry I, was riding north with the king on an expedition against the Scots when he fell ill and had to remain behind at Pontefract. During his convalescence he went out riding and hunting and in the woodlands near to Nostell where he came across a small community of hermits. He was so impressed by their piety that he decided he would like to join them, but first needed the king’s permission. When Henry agreed, he founded the Augustian priory at Nostell becoming the first prior to eleven monks. When Ralph died on the 4th May 1128, he was buried at the ‘Old Place’ – where the old chapel had stood (on the land given by Robert de Lacy) and where the parish church was later built. It seems probable that Robert de Lacy only gave land to the hermits and did not actually found Nostell Priory. Robert did found the church at of St Bartholomew at Colne and possibly built the stone castle at Clitheroe. The parish church of St Bartholomew at Colne. 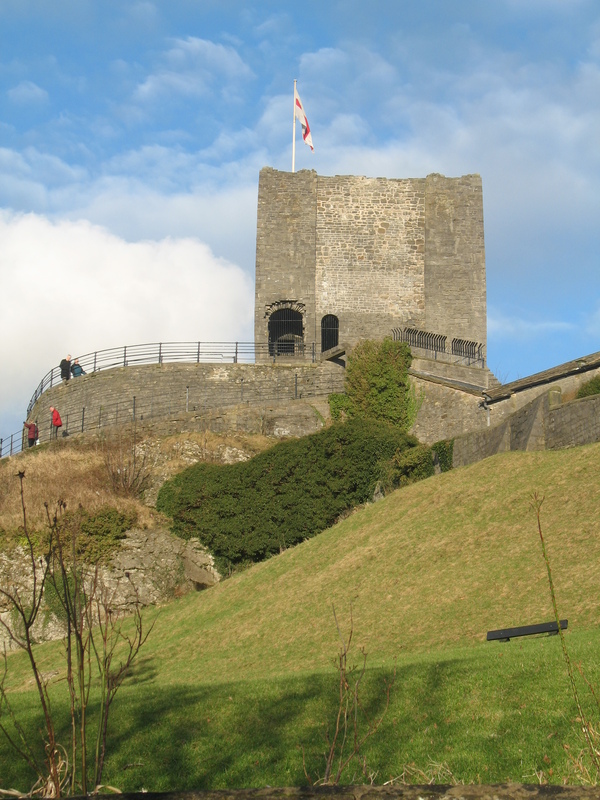 Also see Who Really Built Clitheroe Castle? Very interesting post! The Lacys at Pontefract have always interested me. My mother is a direct descendant of Sir Henry Skipwith, 1st Baronet of Prestwold, Leicestershire and his first wife Amy Kempe. They were both descendants of Gilbert de Clare “the Red,” 3rd Earl of Gloucester and his brother Thomas de Clare, Lord of Thomond, in multiple lines. My father also descended from these men via his gentry background. The de Clare brothers were sons of Maud de Lacy, daughter of the 1st Earl of Lincoln and the line goes from there back to Albreda de Lisours, Lady of Pontefract through her mother Albreda de Lacy. Thanks for your posting! orginaly from Normandy. They joined the conquest of 1066 and your line wound up in present day Lancashire near Clitheroe. The Normans contributed a lot to the heritage of England beyone what most conquests have. That just about sums it up! another peirce of information you may like to know that I found on the LDS website sometime ago, is that Ilbert was married twice- first to a Mary de Muritan, I have not found any information on Muritan , I think it could be Mortaine Ilbert married Mary on 5 May 1061 and that they had a daughter Lucinda, born 2 June 1062 and that she married Nigel de Aurenges, Lord of Halton, Constable of Chester, and their granddaughter Agnes fitzNigel married Eustace fitzJohn, son of John ‘Monculas’ and their son Richard married Albreda de Lisours, great granddaughter of Ilbert and Hawise. 2 people had posted this find, one in America and one in England. I wrote to the one in England to try and confirm the find and he wrote back to say it was correct, but I only have his word for it, though I think it is most likely correct. Also on the LDS site shows John ‘Monculus’as John ‘Monculus’ (de Lacy). Robson states that the Lacy family is very large with over forty coats of arms. Herleva partner of Robert d’Everux the Archbishop is also shown with (de Lacy) in brackets after her name. I have tried finding these postings on the LDS site recently to see if there is any more information but since they have change the format of the site it seems to be an impossible task. That is really interesting. I hadn’t come across it before but if it is correct it shows that there is an even stronger connection between the de Lacys and the Barons of Halton than I had previously thought, and it shows that Roger de Lacy was a ‘real’ de Lacy which I think is important. I also believe that John ‘Monoclus’ de Lacy had that nickname because he had lost an eye. I’ve neglected the de Lacys recently whilst I’ve been working on other projects, but I must get back to them and see what else there is to discover! Hi Elizabeth, my name is Sheila Lacey, and I have been researching the Lacy family on and off for the last 25 years. I found a Hawise de Lacy, born 1012, daughter of Hugh de Lacy, Lord of Lassy and Cambeaux. She married Robert d’Everux, son of Robert d’Everux Archbishop of Rouen, grand uncle to William the Conqueror. One of Hawise and Robert’s children, Hugh. took the surname de Lacy, most likely when he inherited the lands, as Hawise was Lord Hugh’s only child. When I was at the British Library, for a “Who Do You Think You Are” day I spoke to Nick Barret of the National Archives, at Kew London and told him about Hawise and he said that I was correct. I did see it on one other occassion, as a maybe. Trying to find these ancestors can be frustrating, but when you do find them it can be an eureka moment. That’s very interesting Sheila. I’d seen the link with Robert d’Everux but wasn’t sure if it was correct. It seems that Hugh, the son of Hawise and Robert must have been the father of Ilbert and Walter. I hadn’t seen the research that he took the name de Lacy, so your information fills in a bit of my puzzle and means that I can take the family back another couple of generations. Thank you for sharing it. But, as Hugh was the father of Walter and Ilbert, both of whom fought at Hastings and would have been born in the 1040s then chronologically Hugh must have been born @ 1015 (as all the genealogies suggest) so chronologically could not have been the son of Hawise and Robert. Could Hugh have married Hawise (as his first wife – it is thought he may have had two wives, one of whom was Emma de Bois L’ Eveque)) if Robert had died or the marriage was renounced? Hawise would have been the heiress and Hugh could have married her and taken the name Lacy. According to FMG Robert died without issue (although not until 1063). This whole Lacy origins issue generates more questions than answers, but I don’t think that Sheila’s suggestion is one of the answers. I am also a de Lacy descendant. Just found your website regarding the de Mitton and de Lacy families. I am a direct descendant of Hugh de Lacy through his son, Ilbert. It has been a very confusing tree to navigate based on conflicting data that is found on the internet. I was wondering if you ever ran into the family relationship in which Hugh de Lacy’s (b 1020) father was Robert ‘le Danois’ d’Evreux Archevãeque de Rouen? I seem to think that his father was Roland de Lacy (b 995 in Lassy, Normandy, France) or am I wrong? Any help would be appreciated. I haven’t been able to trace the family back further than Ilbert de Lacy’s father with any certainty as I’ve been concentrating on his descendants. But if I come across anything I’ll let you know. Thank you, I appreciate your offer. I am also really enjoying your website. Very well written and interesting!! I think I can help. Ralph the Red had two grandsons by his son Jordan. Hugh and Otto. Hugh succeeded. He granted Bailey manor to Otto who`s legacy’s took that manor name. 6 generations later John de Baileys son Richard married Margarete Shireburn in 1377. Their son Richard, br. 1382 took the surname of his Mother and became the first Shireburne of Stonyhurst Hall. Richard then inherited Stoneyhurst from his grandfather John de Bailey upon his death in 1392. Richards father Richard de Bailey had already predeceased his own father in 1386. This how the Mitton-Bailey-Shirburn scion family lines descended from Ralph the Red, persona of the de Mitton family, who did possess the lands (in Aighton) that later Stonyhurst Hall was built on. These lands came from the 1102 charters sub-feudal grants from Robert de Lacy, his father. For more please see “thefamilydemitton.com” website. Thanks. I hope you enjoy the book, but remember that it is fiction based on fact and not everything in there is the absolute truth. I emailed you some links about Ralph and Mitton. Did you receive them? until you are on the safe list. Checked there too. I did not see it there either. Wow, you hit that out of the ballpark! Excellent well informed answer. Makes sense and removes a big doubt for me. Some have disputed Ralph being the illegitimate son of Robert (1). deny the witness Ilbert (2) but they do. from “Orme the English” the last Saxon Lord of Clitheroe. I conclude that suggests Ralph was very important to the de Lacy’s. which further suggests a close relationship. Mitton history. I find your answers direct, to the point and clear. You have motivated me to buy your book! Very good. I am a Mitton and have been researching the family. I am aware of the Nov. 23, 1102 charter and “Ralph the Red” being identified as “brother” of Ilbert. Later the second one confirming. However, I have come to doubt the bloodline connection to the de Lacys. A descendant de Mitton, Hugh (grandson of Ralph the Red) was alive when Robert de Lacy died. Would he not have had a better claim than Roger Fitz Eustance in 1192. 2nd. You obviously have an excellent knowledge descendent’s of Albreda. I made a genealogy to figure it. So you have credibility with me. Do you have any more on Ralph the Red. His later descendant are the Baileys and Shireburns of Stonyhurst. A lot is in the Coucher book of Whalley. Your contention seems logical, but some dispute that Ralph was an illegitimate son of Robert. I keep going back and forth trying not to contend more than I should in my own history I am writing. Hugh de Mitton would not have had any claim to the de Lacy lands because he was descended from an illegitimate grandfather. His only claim would be to the Mitton land that had been given to Ralph. Roger FitzEustace did not inherit the land directly from Robert de Lacy. It was inherited by his grandmother Albreda who was Robert’s first cousin. She then passed it to her grandson. In any case Hugh would have been Robert’s cousin once removed even if he had been legitimate and so Albreda was still a closer relation. I haven’t made any study of Ralph the Red yet, but I have bookmarked some pages which I’ll email to you. Aubrey (or Albreda), who married Robert de Lisours. Many of the old manuscripts describe her as Robert de Lacy’s German-Cousin, half relative, daughter of his Aunt. There seems to be a lot of debate on the names of her parents. Have you found any evidence that Robert de Lacy and Matilda were her parents? Aubrey (or Albreda) who was the daughter of Robert de Lacy (1) and his wife Matilda married Robert de Lisours and they had a daughter who was also named Aubrey (or Albreda). This Albreda de Lisours married Richard FitzEustace, baron of Halton. Because the first Albreda was the sister of Ilbert de Lacy (2) her daughter Albreda was the cousin of Ilbert (2)’s son, Robert de Lacy (2). Her son John died in the Holy Land and her grandson Roger, inherited the de Lacy estates from Robert de Lacy (2) when he died childless. You may need to read that more than once to make sense of it! It doesn’t help that so many of the family names were repeated down the generations and this is where the confusion occurs. Interesting post. Robert Lacy was one of my ancestors through his daughter Albreda. In that case you are also directly descended from Roger de Lacy who was this Albreda’s great grandson.